Integrate all your applications and processes with best-value Dell Boomi Integrate licences. Boost your ROI with partner advice, fast implementation, and optional services. We sell cost-effective licences for Dell Boomi Integrate, as well as all other elements of the Dell Boomi platform. Dell Boomi Integrate licences are the central element of Dell Boomi’s iPaaS platform. 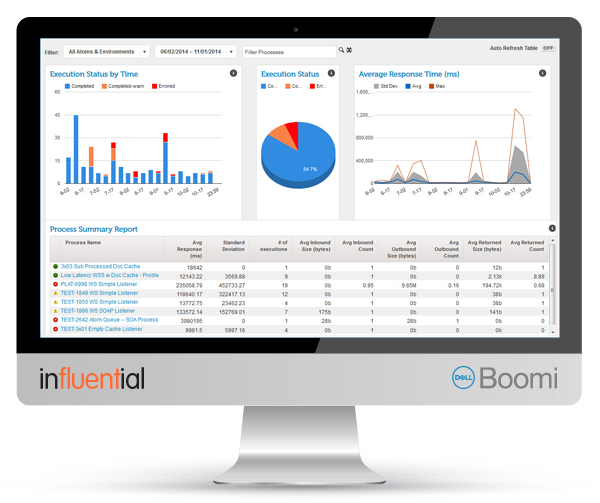 With an expertly selected and configured Dell Boomi Integrate licence, business can easily connect cloud and on-premises applications and data sources. Whether real-time, event-based, batch, ETL, or asynchronous, Dell Boomi Integrate enables all the integration patterns needed for your digital transformation. Dell Boomi Integrate licences are customisable to suit businesses of varying sizes and needs. Versatile Dell Boomi Connectors On top of these editions, over 1,500 prebuilt connectors allow businesses to link virtually anything. Some of the most widely used connectors are for Salesforce, SAP, Oracle, Amazon, Sage, Google, Microsoft, and more. Where a specific connector is not available, there are generic multi-purpose connectors as well as SDK kits for creating custom connectors. The Influential Software development team has decades of experience in this kind of development.